It’s not the MAC, it’s the MAAC. The largely New York- and Connecticut-based conference was one of the nation’s most exciting last season, with almost 30 percent of its games being decided by four points or fewer, or in overtime by any margin. 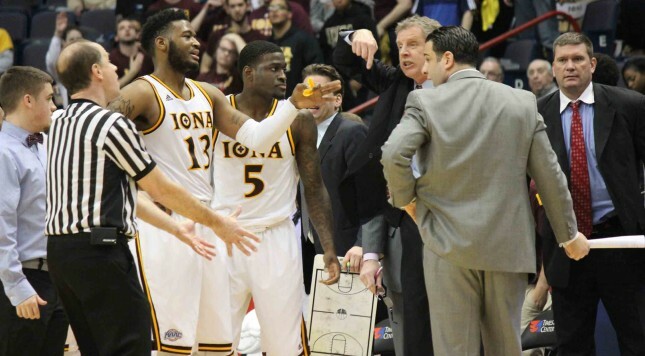 Iona won the regular season title by multiple games, but its awful defense spelled doom in the conference title game, as the Gaels lost to Manhattan. The Jaspers are led by Steve Masiello, who went from hot commodity (after an NCAA tournament appearance and narrow first-round exit in 2014) to pariah after inconsistencies were found on his resume when South Florida attempted to hire him. Even though Manhattan lost in one of the two 16-versus-16-seed opening-round games last March, Masiello is probably one more MAAC tournament title from being a hot name on the coaching carousel again. Whether or not the Jaspers get there remains to be seen. Manhattan returns a large portion of last season’s tournament championship team, but does lose its best player in Emmy Andujar, who took roughly 28 percent of the available shots when he was playing. That is a lot of shots to replace for a team that finished 214th nationally in offense (though they did rebound to finish third in the league offensively), and someone is going to have to step up for the Jaspers. Last season, Iona posted the 38th best offensive rating in the country, finishing just two spots behind Kansas. The Gaels scored 1.11 points per possession in conference play, but their defense let them down big time. Iona finished eighth in the conference defensively, and that defense doomed the Gales in the tournament title game as they allowed over a point per possession to Manhattan. Still, Iona looks to be the favorite this season. The Gaels lose their best rebounder David Laury to graduation, but they return their best player in AJ English, as well as Isaiah Williams, who shot 44.2 percent on 3-pointers last season. The Gaels will also add Wake Forest transfer Aaron Roundtree. Iona finished 9th in offensive rebounding and 8th in defensive rebounding in the MAAC last season, so even though they might have even less to offer on the glass this season, the Gaels have experience winning without being able to rebound. The big question, obviously, is whether they can get stops if they need them. If so, the Gaels could be off to the tournament. The sleeper in the league is Monmouth. The Hawks lose two senior role players, but they should be relatively easy to replace considering Monmouth gave over a third of its minutes last season to its bench. The Hawks were led by two sophomores and a junior last season, so that experience is going to help tremendously this season. Monmouth finished 6th in the league on offense and 2nd on defense last season, so the Hawks need to find a way to generate offense somehow. They were second in the league at getting to the free throw line, so they are trying, but they were ninth in effective field goal percentage and sixth in turnover percentage. Those two things tend to improve a bit with experience, so if Monmouth is as good on defense as it was last season, the Hawks could sneak a tournament bid.